Fils aîné and I have just finished reading Lewis Carroll’s Alice’s Adventures in Wonderland together. I was never quite sure what he made of it, or how much he understood, given the old-fashioned language and so on. At any rate, I enjoyed reading it to him, with occasional qualms about the language. Fortunately it never occured to him to ask what a hookah was, for instance, or why a caterpillar should be smoking one. Hopefully it will broaden his vocabulary in more positive ways, however, and explain to him why flamingos are referred to as croquet mallets, and what grinning like a Cheshire Cat means. It’s important to give children an early grounding in the art of the literary allusion, after all. My major regret is only having a cheap edition I got for 20p at a church fête or similar years ago – it has Tenniel‘s wonderful original illustrations, but the print quality is so poor that they’re hard to see. 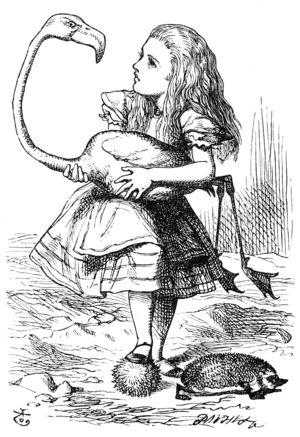 I’m sure Helen Oxenbury‘s version is equally wonderful, but to me Tenniel’s pictures are definitive. 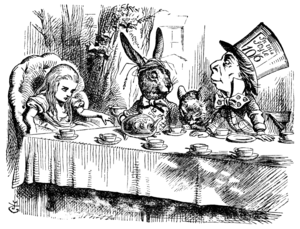 This entry was posted in Books, Children's Books, Reading and tagged Alice Adventures in Wonderland, Annotated Alice, books, Cheshire Cat, children's books, Children's literature, classics, funny books, Helen Oxenbury, illustration, John Tenniel, Lewis Carroll, reading, recent reads, recommendations, reviews. Bookmark the permalink.